In 1977 an obscure Italian private label issued a record that sounded like it no other before. A long and dense trance-inducing drone of sustained notes, rich with overtones and harmonic embellishments, coming from a space so vast and unexplored that seemed of non-human, almost “ethereal" nature. Paradoxically, each and any molecule of that sound was produced using only the most original and archaic of instruments, the human voice. The musicians of the group Prima Materia - a project founded by Roberto Laneri in San Diego in 1973, including Claudio Ricciardi, Gianni Nebbiosi, Susanne Hendricks and Maria Monti - individually researched and developed unusual vocal techniques (originally used in Tantric rituals in North India, Mongolia and Tibet), based upon the use of overtones coupled with a special state of inner concentration, which was the essential condition for both the emission and control of long–sustained and complex vocal sounds. Their capacity to sustain a note for what seems an eternity, and then continue to provide endless variations generates a continuous and sustained drone of sound, in which the overtones are clearly perceived. The name of the record was “The Tail of the Tiger”, and it was issued by the Rome-based Ananda label, ran by Roberto Laneri with Alvin Curran and Giacinto Scelsi. The record soon disappeared, acquiring an almost legendary status among collectors and experimental music lovers. Die Schachtel recovered the original tapes and in 2007 released a limited CD edition of “The Tail of the Tiger”, that again went OOP in a few months. Ten years after that memorable edition we have decided to remaster the tracks, and add a stunning take from the 1974 Köln live concert, a dimension that was ideal for the Group improvisational technique and conceptual approach to sound. 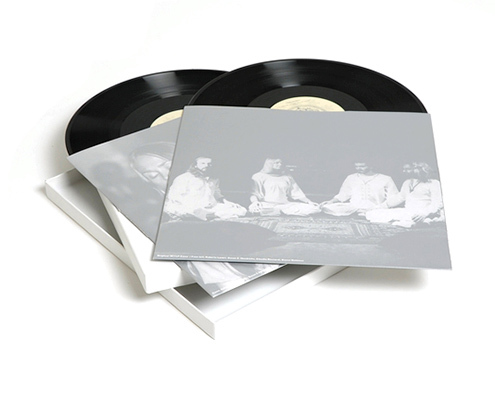 The result is a stunning deluxe double-LP boxed edition, complete with a 4-page explanatory booklet, a 16-pages “Mandala" booklet designed by Dinamomilano and inspired by the group's references and philosophy, custom inner sleeves with original photos printed in silver on deluxe coated paper, and of course two hi-quality vinyl records pressed in Germany.